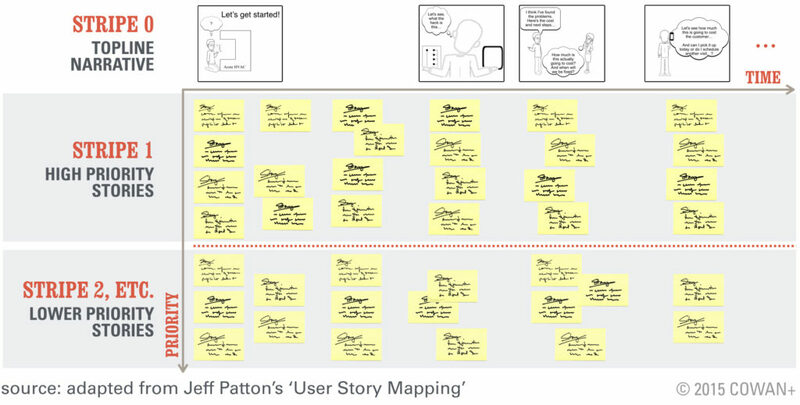 This article will show you how to create better user stories. You’ll learn how to write them like a designer, test them like an entrepreneur, and use them to drive better discussions like an agile coach. If answering those questions seems like a lot of work, I’ll mention here that taking stock of new product failure rates, IT project failures, and the portion of features that actually are substantially used, something on the order of most or at least ‘a lot’ of software ends up lightly used or quickly scrapped. Skillful use of stories will improve your outcomes, your economics, and, most importantly, your team’s sense that the work they’re doing matters to the user. If you’re writing a story, your job is the fill in the (red) blanks. The persona is a vivid, humanized, yet operational description of your user (see also personas tutorial). The ‘[do something]’ is a goal you assume the user has. The ‘[realize a reward]’ clause is a testable statement of how you’ll know if the user realized that goal. The [realize a reward] clause is the most neglected by most story writers and yet it’s the most important. The single best litmus test for whether you have a good story is whether you could put a simple prototype in front of a user, ask them to act on the goal you’re assuming, and see if they can achieve it. With this story, a designer or developer (or someone acting in that role) could put a sample job description in front of an HR manager, give them the goal of picking quiz topics for it, and see if they’re able to realize that goal with the team’s current prototype or working software. There are schools of thought that the specific story format or the third clause [realize a reward] isn’t that important. That just isn’t consistent with my experience. Every time I talk to a team that’s loose with story format, I’m seeing data that indicates they would benefit from front-loading value and driving to more specifics about user goals so they iterate to something valuable and avoid waste. Pro Tip: There’s a tendency to want to build software that’s ‘not specifically wrong’ versus specifically right or specifically wrong. Resist it. Successful teams build in small batches with careful observation about whether they’re right or wrong, but they build against tightly defined assumptions about the user’s goals. Epic stories describe a user action and the child stories detail that action. Test cases and notes are a place to add further details and points to discuss relative to individual stories. Both types of stories have the same format- the format you saw above. There’s a school of thought that epics are really big, and they certainly sound big. My general advice is to keep them relatively small. I do a lot of training on story writing workshops and 95% of the first time child stories I see are actually what I would start with as epics (and the draft epics are overly broad in scope). Why? Well, developing and operating software is expensive. You might as well have good narrative coverage with stories on everything you’re building to drive better discussions about what will be valuable to the user and how you’ll test it. The alternative is to just guess and I can tell you how that works out- not well. The child stories and their test cases them decompose that epic into more detailed steps (see Reference A for the full example). By the way, if you have the urge to start drafting, good on you and here is a Google Doc’s template you may find helpful: User Story Template. User stories are a type of specification, right? NO! They’re supposed to serve as a centerpiece for frequent interdisciplinary discussion about how to implement something valuable to the user. This is kind of where the use of stories and the practice of agile need to converge. If you’re not familiar with agile, I recommend the aforementioned link or, hey, my agile course, but the basic idea is that instead of working in a sequential (waterfall) way from specification to development to test to release you’re doing all of those things together in small batches. In the next section, we’ll step through how to create stories like a designer, but I’ll close with a few cautionary notes about what to watch out for with your user stories. Why are most user stories so bad? I know it sounds silly, but you’re probably working with people that implicitly think this to a degree. It’s true- amazing things happen with software. But that software wasn’t automatically magic; someone had to put the magic in it. That someone is you. The next section will show you how to conjure that magic. To a degree, we all just want to finish our work and go watch Netflix. That’s fine. That’s natural. But, if you want to build great software, you have to want to consistently ask the hard questions of your colleagues and your work about whether what you’re doing is still making sense. Is there a strong, testable case that it’s going to valuable to the user? That’s hard to do consistently. A lot of product managers just slam user stories into JIRA and call it a day. It’s not that hard to run a more thoughtful, disciplined program, but it’s not that easy either. You have to really want it. You have to know your user and what’s on their A-list to write good user stories. Without that, you’re just going to be groping at some idea about what the software might do and then spending way more money than you need to to find out if you’re right or not. There’s an easier (and way cheaper) way, and that’s what this next section is about. Remember when your high school English teacher told you to ‘Write about what you know?’. That was always hard for me in high school because, really, I didn’t know much. Likewise, if you don’t know your user, writing good stories will be hard. This is not to mention that now what you’re writing really matters- you’re about to define lots of spending on creating and operating software. Do precisely what the user asks and you’ll probably end up in what my friend David Bland calls the ‘Product Death Cycle’: a) no one uses the product b) you ask customers what features are missing c) you build these ‘missing’ features d) go back to ‘a’. Assume that you already have all the answers and you’ll probably end up with a market size of close to one (you and maybe a few people just like you). What’s a conscientious product person to do? The good news is that there’s an approach that consistently works. The bad news (it’s not really bad ; ) ) is that it takes some work of a type that may be new to you. The tool I’d start with is the idea of ‘personas’. These are humanized views of your customer, be they buyer and/or user of your product. It turns out this is the most actionable and testable way to build products and systems. The basic idea is that you want to name the persona to humanize them (‘Helen the HR Manager’) and have an idea about a day in their life. What shoes do they wear? What’s the first thing they do in the morning? Then you want to dig into how they relate to your product or system. What do they Think about how things work now vs. how they’d like them to be? What do they See others doing that influences that perspective? How do they Feel about the job or habit you’re building software to improve? What do they actually Do in your area of interest? How much? How often? You’ll probably find you need to go out and talk to a few of them to obtain this information, but if you have a strong Think-See-Feel-Do understanding of your user, I think you’ll find stories are a lot easier to write and to discuss. For more depth and some examples see: Personas Tutorial. For notes on how to interview users to create personas see: Customer Discovery Handbook (Persona Hypothesis). For a structured tour of these, see Agile Meets Design Thinking on Coursera and the Personas section of Running Design Sprints. Once we have a strong persona or personas, we need to consider and test what underlying jobs or desires we’re going to make better for this user. Do they really exist? Are they important? This is worth exploring since if you’re solving a problem that doesn’t exist, you can develop perfect software and still fail to deliver any value to the user. How do you identify and describe these problem scenarios? First, simply consider what it is that you’re actually doing for the user- helping them stay connected to friends? checking their accounts payable for suspicious patterns? Then make sure you can describe an alternative (ideally you’ve talked to users and already know). Maybe your user sends out a holiday card to stay in touch with their friends. Maybe they just look at large accounts payable and spot check/audit them. Make sure your definition of the problem scenario is general and could apply equally well to the current alternative as it could to whatever it is you’re planning to do to make things better. This will help you avoid bias and stay focused. I said a good problem scenario can be applied equally well to the alternative or your new proposition. Helen the HR Manager’s alternatives for screening technical talent might be: checking resumes, calling references, or just taking their word for it. I’d say the problem scenario definition works for those alternatives as well. What if we took the problem scenario and went up a level of abstraction? Then it might be something like ‘Hiring technical talent.’ Now, that’s probably too broad, but it’s helpful to know so that a) you know you’re at about the right level of abstraction with your core problem scenario and b) that you’ve identified the general area in which you’re working. Now, you may notice the note about ‘Why? (Motivation)’- I do also recommend testing whether the customer prefers your solution(s) to a problem scenario over their current alternatives. However, I don’t want to stray too far from the topic at hand. 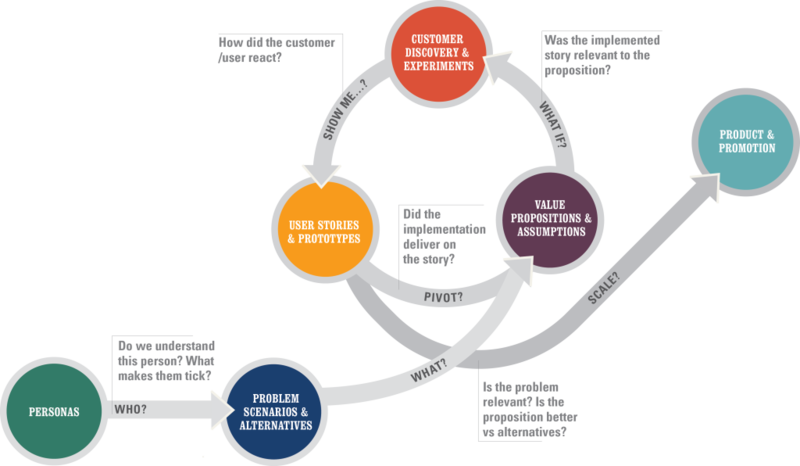 If you’re interested in the overall process, check out the Venture Design page. For related tutorials, templates, and online courses, see the end of the section above on Personas. Once you’ve learned about your user enough to know you really should build software, it’s time to work through some stories. What you want to do to make their lives better? How will you know if you did that? Your user stories should be detailed and they should be testable. Why? Well, because what you’re really deciding is how much of the software/systems you’re going to invest in building will be supported by carefully considered ideas about what’s valuable to the user. Based on the stat’s I cited at the intro. (that something on the order of half of all software ends up in a fail), I’d say odds are many teams have room for improvement. That’s easy to say, but hard to do. I know I’m always working to do better. Let’s take a look at a few specific examples. You could use this as a starting point for your next stories, but it’s not immediately actionable for design or coding. Also, if you’re only going to work with one additional layer of abstraction in your stories (child stories under an epic), I think you’re going to end up with stories that are too vague and a working environment that’s not well backstopped by narrative. The story above is really analogous to the problem scenario we talked about in the last section: ‘Screening Technical Talent’. For stories, I’d start with more actionable specifics (and tie them to problem scenarios if you want to make sure they’re well supported by customer discovery). I’d say this is getting close, but that last clause about the reward, ‘so I know their skills profile’ still needs some work. That clause is so important, I think it deserves its own subsection! That’s up next. Storyboarding is an excellent tool pushing yourself and your team to think substantially about your customers, what they want from you, and what they’re really doing in real life. Especially if you’re developing something relatively new, I highly recommend storyboarding your epic agile user stories. This last one is particularly important if you’re new to product development. I coach lots of first-time entrepreneurs, and their #1 challenge at the product implementation phase is thinking through what they want in enough detail. Most of their stories are actually epic stories (or broader) and need more granularity and sequence- storyboards help. A classic failure mode is leaving your development team to design your product. This not to say your developers can’t think creatively or answer these questions, and part of the point of these inputs is to stimulate creative discussions with them so the team’s collective imagination and expertise is maximized, but your job as the product person is to provide a well-articulated, thoroughly considered starting point. For more on the process of storyboarding (including tools and templates), please see: Storyboarding Tutorial. The last clause of your user story should always contain a testable reward. Reward sounds exciting but all we’re talking about is: a) does it describe the successful accomplishment of whatever goal first triggered the story and b) can observe in a user test? Now how does the clause do on our tests about a) describing their accomplishment and b) being observable in a test? I’d say it describes the HR manager’s immediate goal- being able to use the test. Is it testable? We could take the user through the creation of a new test and then ask them how they’d administer it and see if they have the right answer. I’d say it’s testable. Basically, what this is saying is that if the customer/user is really motivated to do something (imagine a point on the upper left), then it can be relatively harder for them. If a user isn’t that motivated (imagine a point on the lower right), then the action needs be relatively easier. If you’re building a product or feature, what this clearly implies is that you need to take a balanced view of motivation vs. usability. Most products and projects I see are very focused on usability. However, most of them haven’t tested motivation: Will the user really prefer this product or feature over their current alternatives? Instead, they often confuse it/mingle it with their usability testing, for example asking about a prototype ‘Do you like this? Will you [use it, buy it]?’. That doesn’t work- the subject will always give you a ‘yes’. For more on why see specifically this post on the ‘yellow Walkman problem‘ or more generally the here tutorial on Lean Startup. Suffice to say here that the kind of testing we do relative to user stories deals with usability- that’s why they call it ‘usability testing’. What they means is that we’re assuming they’re motivated (controlling for motivation, if you will) and just testing for usability. What this means is that if we’re testing a piece of software that allows users to paint virtual walls (bear with me), then we don’t ask them ‘Do you want to paint this wall?’. We don’t even ask them ‘What color would you like to paint this wall?’. We ask them ‘Would you show me how you’d paint this wall yellow?’ and then we’re seeing how hard it is for them to do that and thinking about how we can make it easier. How do we test stories? Have you ever heard something like this: ‘We don’t do as much user testing as we probably should because by the time we can test the software we’re already up against our deadline.’ As sympathetic as I am to those deadlines, I just don’t think this is a good reason not to be testing usability. When you’re doing early testing, rough prototypes (physical or virtual) will work fine- you don’t need an engineer or (with the right process) even a formally trained designer to test the efficacy of different approaches. My advice is to maximize these opportunities early on in your story formulation. On a related note, I highly, highly (2 highly’s) recommend anchoring your test items in user stories as opposed to interface-specific goals like ‘see if the user understands our drop down menu’s’. For a quick overview of how to do this, I recommend the Usability Testing section of the Customer Discovery Handbook. For a more in depth view, I recommend Running Design Sprints (course 2 in my agile specialization on Coursera) and Testing with Agile (course 4 of the same). The prevailing thinking around modern software development is that you should treat your product, in fact, every feature within your product, as an ongoing experiment. While it drew heavily on agile, it’s really the body of work around Lean Startup that’s popularized this. Their central heuristic is ‘build-measure-learn’. I prefer the terms you see in the blue loop here but fundamentally they amount to the same thing. The beginning of any good answer to the question above begins with the acknowledgement that you just can’t predict (with any consistency) what’s going to be valuable for the user. Therefore, you need to work with testable ideas and closed-loop experiments to see if you’re right or not. Yup, it’s a lot of stuff. My particular approach to making it manageable and actionable is Venture Design, which is described in the diagram below. If you really want to dig in and make sure you’re iterating to something valuable with a minimum of waste, I highly recommend taking a look. That said, let’s move on to developing with stories! Odds are good that if you’re doing agile you’re using scrum or a scrum-informed take on agile. If you have someone in the ‘product owner’ (PO) role scrum prescribes, you’ve probably heard that it’s their job to write the user stories. That is a reasonable starting point. That said, the best way of looking at it is probably that the PO is the lead on writing the user stories vs. solely responsbile. Based on experimental results, it’s possible (I would guess likely) that people are only actually understanding 1/40 of what we think we’ve told them. A PhD candidate at Stanford did an experiment where one person (a ‘tapper’) would tap out a song and another party (‘listener’). The tappers guessed that they’d been understood 50% of the time where actually the listeners had actually understood only 2.5% of the time- off by 20x. Yikes! What if that’s true of the stories we’re writing and the understanding we assume a designer and/or developer will have about how to build software against that story? Is that somewhat consistent with the kind of disconnects you see between ‘businesspeople’ and ‘technical people’? If you’re slamming your user stories into JIRA and assuming they’ll be understood, you’re probably going to run into issues. By the way, I first read about this in the Heath brothers’ excellent book ‘Made to Stick’. A certain part of us just wants to know in the simplest possible terms what our job is and how much of it we have to do. We crave certainty and an immediate sense of accomplishment. If someone tells me my job is to dig six holes, part of me just wants to do it and be done. It’s fine- it’s just human nature. Unfortunately, you can’t build software that’s valuable to users this way (at least not with any consistency). If you don’t co-create stories with your team, they’re just not going to feel like they own them and their work won’t be as thoughtful. Since the stories are probably your job I’ll apologize in advance for saying so, but don’t blame the implementation team- you’d act the same way in their position. Again, it’s just human nature. If you’re the lead on creating stories, part of your job is to solve for the two problems above and help elevate your team to a high functioning practice of agile. Naturally, others will have great ideas about what the user might want and how to implement that in software. Beyond just doing your story writing with the extended team, this is the reason why the whole team is generally included in the increasingly popular practice of running design sprints. One specific method of encouraging good outcomes around stories is having the PO/story lead run story writing workshops, which we’ll cover in the next section. How do you use stories within a team? The story map does a few jobs for you: 1) helps you think through the right stories 2) helps you prioritize them and 3) serves as an ‘information radiator’ to keep the stories visible as you work on them over the course of weeks or months. If you’re in charge of managing your team’s story writing workshops, I think you’ll find it’s a very valuable tool. Let’s talk about how to make one. The first stripe (0) defines the x-axis of the story map and represents the customer/user journey. It’s best built with storyboard squares. 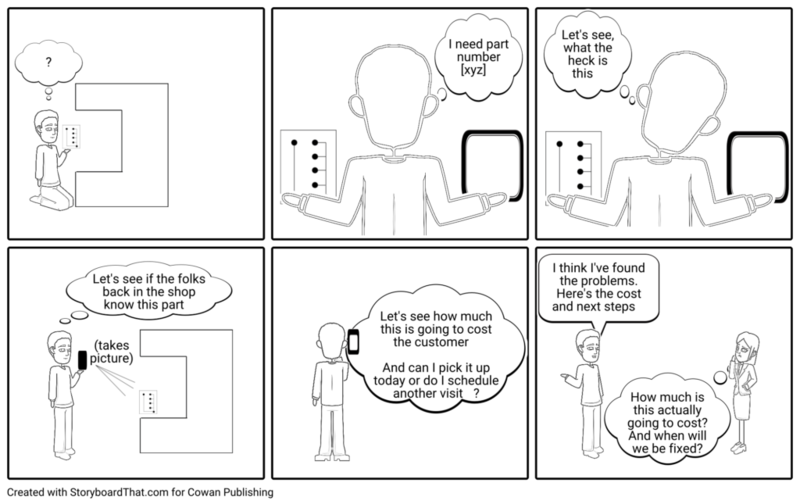 The reason why the seemingly silly details in the storyboard squares matter is that every single thing you can do to help keep your focus ‘outside the building’ and on the life of the user is going to help you drive to better outcomes more efficiently. Fine point: If you’re storyboard your epics (great idea! ), then what you’d probably want to do on ‘stripe 1’ is to pick and choose among those to create a kind of summary. The reason this is a good idea is that a well articulated epic will usually have many more storyboard squares than you’ll want with the size and density of a typical story map. Let’s talk about stripe 1+ and the y-axis. The y-axis describes relative priority, so stripe 1 is higher priority than stripe 2 and so forth. If you have a bunch of stories about how a user would search for a product, you’d put what you assume is the most common/important story in stripe 1, and then less common types of search stories in the same vertical space within stripes 2, etc. 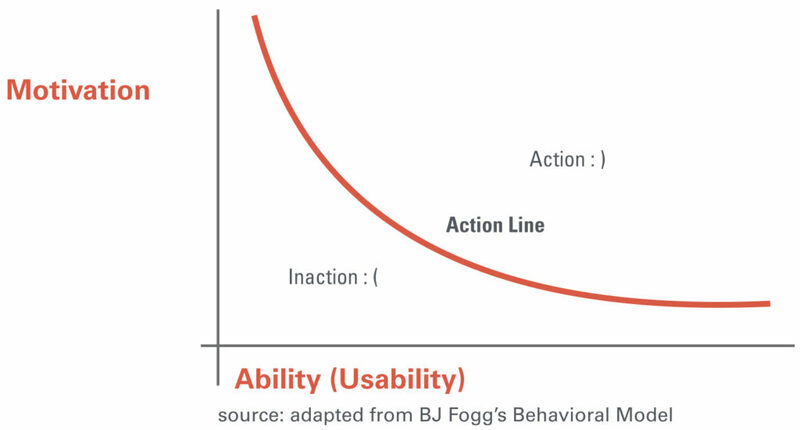 Careful prioritization on this axis relative to the x-axis/user journey is a subtle but important part of any high-functioning agile program. The best explanation I’ve heard comes from agile thought leader Bill Wake: Let’s say you’re building a site where the basic user journey is a) search b) select c) purchase. It’s natural (but a terrible idea) to build out all the search functions and then move on to select, etc. The reason it’s a terrible idea is that you won’t be able to do any meaningful user testing or market/release testing. The user can’t do anything potentially valuable by just searching for stuff. In a high-functioning agile team, you’re iterating through the thinnest possible slices of your story map, testing, assessing, and then building more software. How do you use stories day to day? In a high-functioning agile environment, when anyone is unsure of an implementation detail, they have a discussion around user stories- see the blue button moment above. I’ve shown you how to put yourself in a position to write strong stories that are anchored in the life of the user and highly testable. You’ve also seen how to organize and prioritize stories with a story map. Ideally, you should be able to implement your stories in any order while still realizing the benefit of seeing something working at the end. This is important for two reasons. First, you lose a lot of the adaptability agile’s supposed to deliver if your stories have (many) interdependencies. Second, independence makes it much more likely that you can sequence what you do such that it’s meaningful to users and testable with them by the end of an iteration. Spotify is known for its success with agile and other adaptive techniques. This slide from one of their talks summarizes the value of Independent (and Valuable and Testable). User stories are not requirements. It’s a combination of stories and regular discussions that are meant to replace requirements. You should revise stories freely as you and your collaborators come up with better ideas. Each story once implemented should be both functional and relevant to the customer/user. We’ve talked a lot in this post about how to achieve that. A quote from Bill Wake’s original post on why this is important in software development projects: Developers often have an inclination to work on only one layer at a time (and get it “right”); but a full database layer (for example) has little value to the customer if there’s no presentation layer. Estimating’s kind of controversial in the agile community and not without good reason: It can lead unnecessary overhead and pointless recriminations when the final output doesn’t ‘agree’ with the original estimates. These are all things agile strongly tries to help avoid. If I were to offer three silver bullets on this, they would be: 1) Write good stories based on validated insights about the user. 2) Make sure everyone understands and agrees that the estimates are very approximate (like Small-Medium-Large) and for purposes of prioritization. 3) If you want to do post-mortems on estimates vs. actuals, make sure there’s general agreement that it’s to help the team in some actionable way and not just because someone’s frustrated there isn’t more implementation done. Your unimplemented stories are like a box of chocolates…ah, scratch that, reader; never mind. Basically, your stories need to be Small for you to get the adaptability and reduction in overhead that agile offers. Big stories reduce opportunities for incremental testing and require more elaborate planning. As the author of a story, you should be able to write tests that would allow you to validate that an implementation delivers on your intent. Many teams operate this way, but regardless of what everyone else does, you’ll do yourself a big favor by writing some functional test cases in advance- you’ll be much more likely to get what you want more easily. This epic story deals with the example company Enable Quiz and the HR manager wanting to create a quiz to screen engineering candidates. is organized in a more conventional fashion (vs. the epic above that’s storyboarded). Here are a few other epics that might follow this one. READY TO WRITE USER STORIES LIKE A DESIGNER?